The best chicken soup is made from a homemade stock, patiently rendered over a few hours and coupled with a beautiful, tender roasted chicken that’s pulled from the bone and married with a pretty chop of the tried and true mirepoix… onion, celery and carrot. The homemade-stock variety of this soup classic is often something that’s contemplated and planned for. It’s comfort food at its best… warm, soothing and satisfying. Perhaps it’s a pot you put together on a lazy Sunday afternoon? 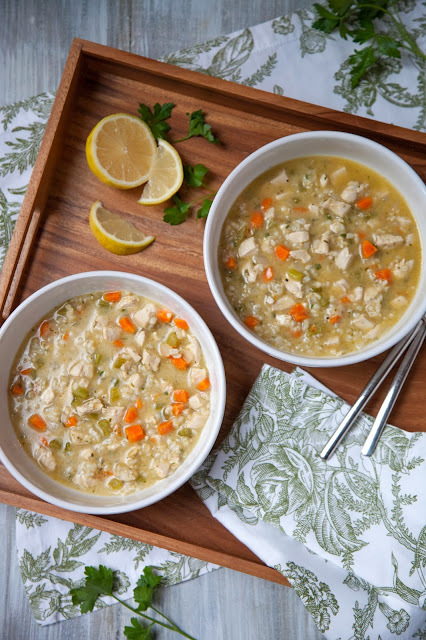 And then… there’s everyday cooking and the desire to still have that homemade chicken soup flavor… in 30 minutes. Soup is such a comfort food and you just don’t always have hours to get there. The trick is to build flavor… even if it’s only 30 minutes you have to work with. There’s still time to craft a tasty, satisfying bowl. Here it’s achieved by being a little patient with that ever-important veggie trio and getting some seasoning on it that can develop some aroma and flavor, and just the right texture… before getting doused with broth. The chicken (in this version) is diced into small cubes to mimic the veggies and gets a little seasoning and swim time before the rice joins in. The seasonings are fairly standard… dried parsley, tarragon, a bay leaf, salt and pepper. When the soup is almost ready to ladle out, it gets a good little squeeze of fresh lemon juice and a little chop of fresh parsley. These last two layers add a fresh pop of flavor that is subtle but do much to brighten up this soup... cutting through what can sometimes be a monotone flavor level without it. 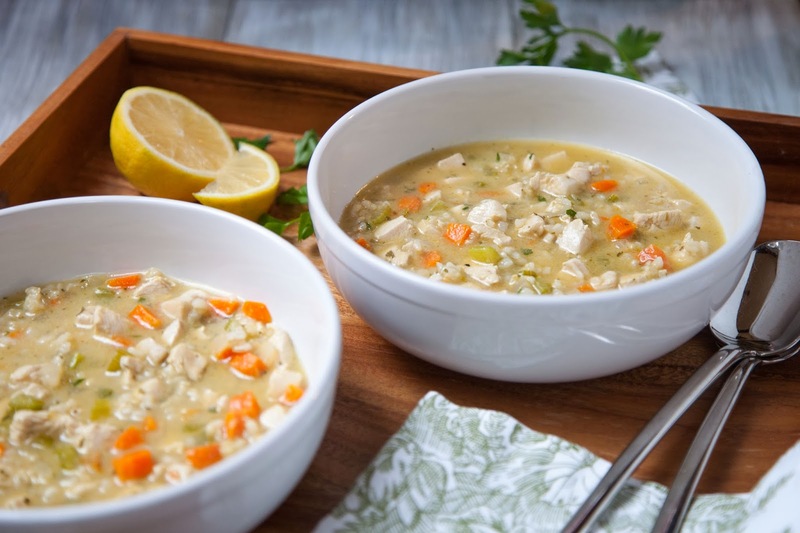 Just a little spritz of fresh lemon adds wonders to the flavor dimension of chicken soup... it's a naturally bright flavor note that a soup like this kind of begs for. 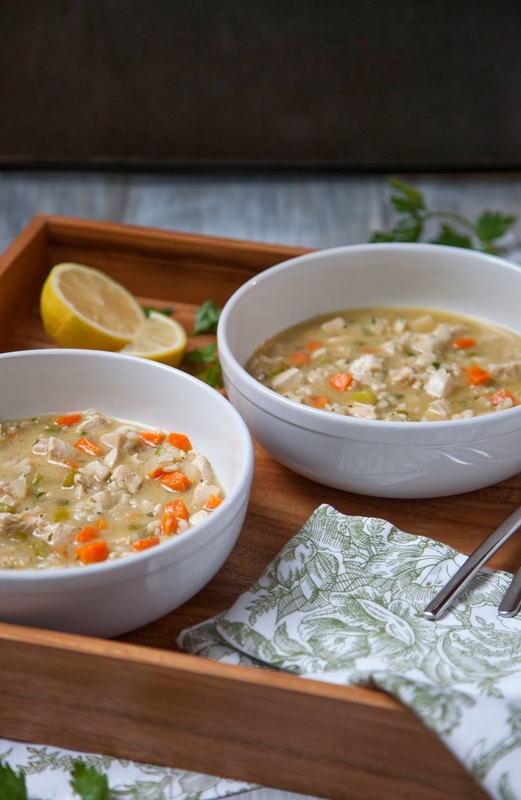 This is a 30-minute Chicken & Rice Soup that does a good job of delivering a tasty bowl of comfort… patiently planned for, or not… perfect for a busy weekday or a truly lazy Sunday afternoon. Keeping the dice of the mirepoix and chicken to about 3/8" to 1/2" allows you to achieve a spoonful of soup that has a bit of everything in each and every bite. It also cooks up much faster when diced small! Heat oil in a large pot or dutch oven over medium to medium-low heat. Add celery, carrot and onion and sauté for about 8 to 10 minutes, stirring intermittently, until veggies are cooked through but still firm (al dente). Add seasonings to veggies and continue to cook, stirring to combine, for about 1 minute. Add 32 ounces of broth, along with cooked rice and bay leaf. Turn heat up to medium to medium-high to get stock to a full simmer. Lightly season raw chicken with salt and pepper and then add to pot and continue cooking soup for approximately 20 minutes, stirring intermittently, adding up to another 2 cups of broth as needed to thin out. (Save remaining 2 cups broth to thin soup out on Day 2, if needed.) Add splash of lemon juice (to taste) and fresh parsley. Add additional salt and pepper, to taste. Ladle and serve. * If I don't already have rice made, I put my rice on in a pot of water (more than cooking instructions call for) and get it to a boil with some salt. Then cover, reduce heat and simmer. (I check it along the way... 15 minutes... 18 minutes, etc... tasting.) It's done well in advance of the soup and can be popped in when ready.